19th August 2014, planet Earth: humanity has exhausted all the biological resources provided by nature in one year . According to Global Footprint Network, last 19th August was the Earth Overshoot Day 2014. That means, from 20th of August till the end of the year 2014, in order to support world consumptions and human activities, the world economy has to exploit natural resources, such as water, soil and gas, that nature is not able to recover back as usable as well as all the carbon dioxide emissions will not be assimilated by the ecosystem anymore. Till 70s, human activities where below Earth’s biocapacity. From 80s, the world economy has always overshoot the biocapacity and it’s getting higher and higher every year. Financially speaking, is like withdrawing from a bank account more money than incomes: It’s not sustainable in the long run. Therefore, according to principle N.7, Governments and policy makers can regulate market ecological inefficiencies towards sustainability as well. For example, through incentives in renewable energies (see also principle n.2), taxes or regulations. As an example, with regards to climate changes, Mankiw himself suggest (see A Carbon Tax that America could love with, New York Times ) to put a price (tax) on carbon emissions. In such a way, Governments, by charging a fee for each carbon emission, will “internalize the external costs” due to climate changes (hurricanes, global warm,…). Prices of Product\Services with higher carbons emissions will have higher prices and thus people will be inactivated to buy other products with less carbon emissions (see also Principle N.2), look for alternatives, or even not to buy it (see also principle N.1). Since people have a limited amount resources in terms of time and money, behind each consumptions there is always a tradeoff. as a trade-off for introducing in the ecosystem less carbon emissions and waste. Therefore, people decision-making and how much people is sensitive toward sustainability issues when consuming, have an impact on the ecological footprint. In order to achieve ecological sustainability, there are two approaches argued among economists, activists, biologists and mathematicians. One is through regulations (tax, incentives, agreements,…) and the second one through more responsable decision-making by consumers and firms. Regarding regulations, Mankinw’s himself complained how difficult is to convince politicians to put a fee on a carbon tax. Elections debates are about reducing rather than increasing taxes  and usually people is not willing to vote a candidate who promotes new taxes. Concerning Decision Making, some researches applied thermodynamics principles (2nd Law) to Economics (Thermoeconomics) and theirs conclusion was that each money transaction as well as consumptions is essentially a flow of energy . Thus, no matter if the decision is to buy a smaller and more, fuel-efficient car or use public transportation: an amount of energy will be dispersed anyway. But, what happen in everyday life when a new car is bought? Actually, there is a money flow from the consumer to the retailer. Why not considering money as a measure of energy and biocapacity flows? Some scientists already pointed out the missing link between Information Theory (Cybernetics) and social sciences (e.g. economy) as well as biologists have some concerns about sustainability of an economy based on endless growth. Thus, how to create a link between human economy and the Earth biocapacity thanks to the achievements and researches in Economy, Physics, Biology and Cybernetic? 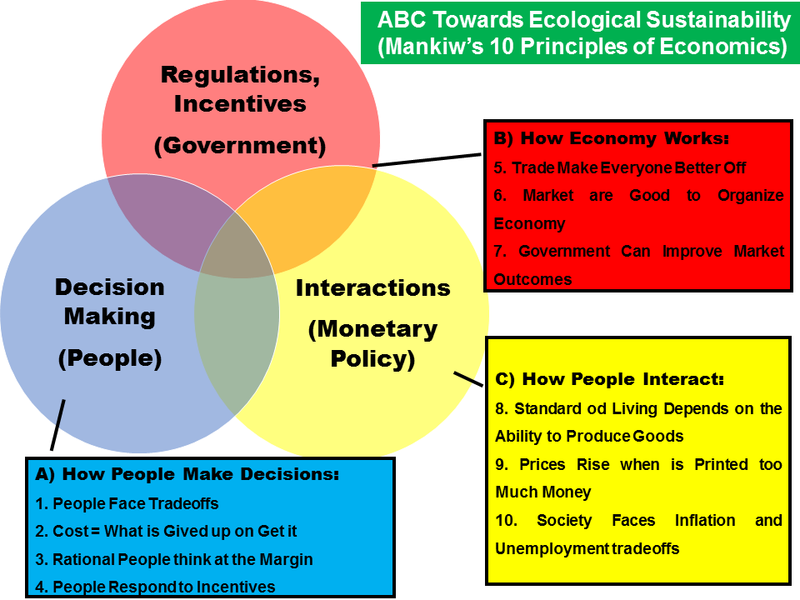 Decision Making and Policies have a key role for pursuing economy towards ecological sustainability, as described by Mankiw’s principles from number 1 to 7. Nevertheless, till economy is not linked with natural environment and its limited biocapacity neither policies and more conscious behaviors towards sustainability will be effective since what is missing is how people interact: money flows and monetary policies. So, how much does it cost to give up to link economy with natural environment?. There is an Optimistic View about a self-regulation of the world economy that, thanks to the supply-demand’s law, will guarantee an endless growth and energy efficiency as well . However, relying mainly on the supply-demand’s law it is a reactive, rather than proactive, attitude towards sustainability. Since economy is also a social science, having such an optimistic view it means forgetting what happened in the 18th century to the population of Easter Island: they dropped from 15.000 to 2.000-3.000 inhabitants because of an ecology disaster created by themself. People of Easter Island realized supply-demand’s effect when it was too late for recovering their ecosystem and its biocapcity. Economy, ecosystems and complex systems in general, have outcomes that are not predictable and controllable in the long-run. Avoiding to consider the constraint of a limited Earth’s biocapacity, it means avoiding the risk of definitely compromise the entire ecosystem without any chance for recovering. So the question is: would all humankind be reactive or proactive towards the ecological sustainability issue? This entry was posted in Economy, Human Science, Leisure, Funny stories, Miscellaneous, Physic, Science & Technology, Society and tagged #biocapacity, #ecological, #economy, #footprint, #Mankiw, #sustainability, thermodynamics by ivangruer. Bookmark the permalink.